Kh. Harithiya is a large Hellenistic and Roman period city, located near Kibbutz Shaar Ha'amakim It is identified as "Geva" or "Gaba". Josephus Flavius (Wars 3: Chapter 3: 1): "Gaba, which is called the City of Horsemen, because those horsemen that were dismissed by Herod the king dwelt therein;"
Khirbet Harithiya was a large city in the Hellenistic and Roman periods. The site is identified as "Geva Parashim" or "Gaba" or "City of Horsemen", based on Josephus Flavius 's description. Khirbet Harithiya (Arabic for : "ploughed land") is located near Kibbutz Sha'ar Ha'amakim ("the gate to the valleys"). 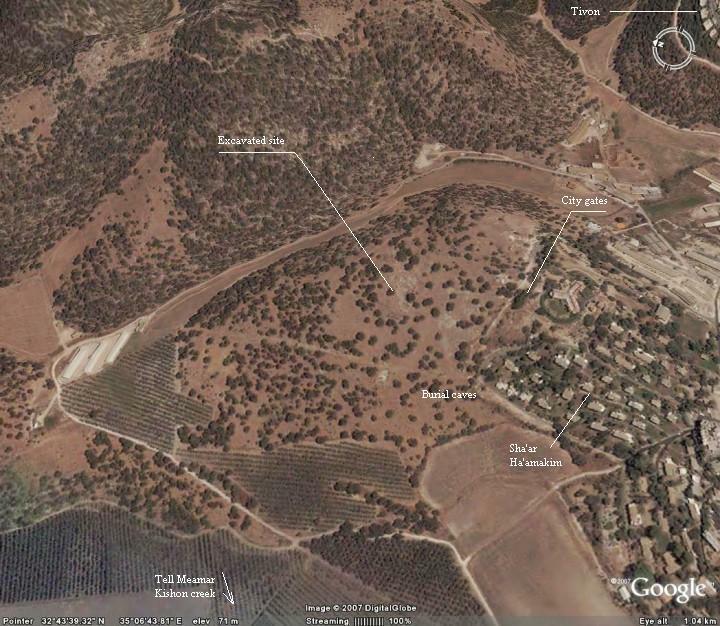 This aerial map provides a close up on the main area of Khirbet Harithiya, on the north-west side of the Kibbutz. The site is located on a hill (100M), surrounded by valleys on 3 sides. 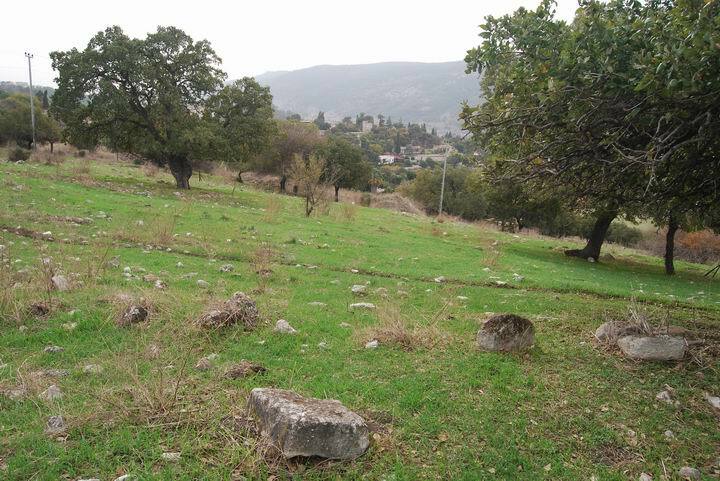 As seen on the photo, there are traces of ancient walls around the site. The road from the south side entered through the city gates, and traces of them can be seen at that point. The city first started in the late Bronze period in Tell Meamer (el-Amar), located 1.5KM to the east, just behind the Kishon river. The city is identified as "Geva Shemanim". Later, the city on the Tell gradually became a minor site and finally abandoned, since it was too small for the larger population. 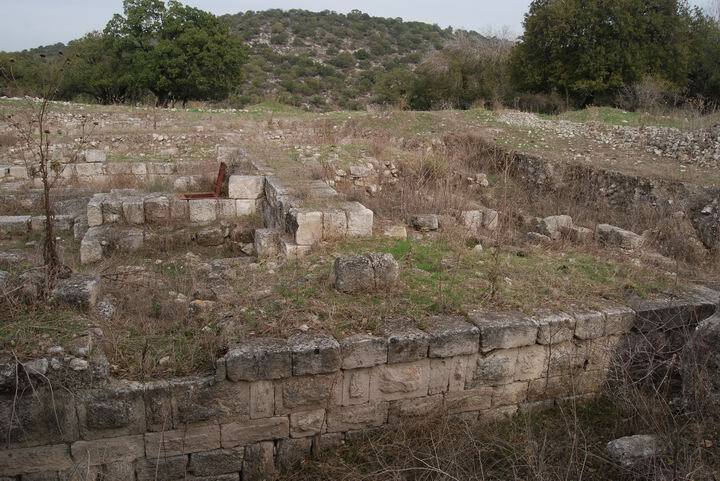 The new city was established during the Hellenistic period on the hills east of the Tell, in Khirbet Hartiya. It first started as a farm in the Persian period, grew, then finally replaced the old city. 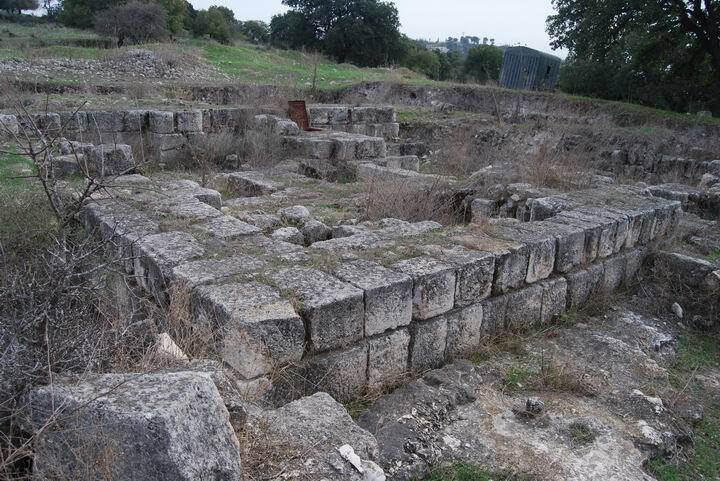 In recent years large structures from the Hellenistic period were excavated - see photos below. Note that there are debates among scholars on the location of Geva during the Hellenistic period. Some rely on Josephus description, which makes Khirbet Harithiya the best candidate. However, there are other opinions - check the references. The new site continued to grow in the Roman period. The new city was the place where King Herod resettled his retired Horsemen. It is called also as Geva-Parashim (the latter means "horsemen"). It is described by Josephus Flavius (see below). The city was probably given to him by Augustus in 30BC after his victory over Marc Anthony and Cleopatra, in addition to Jaffa and other coastal cities. In the Jewish revolt (summer of 66) the Jewish mob attacked the Roman military unit in the city. The city continued until the early Arabic period (6-7C AD), then it started to decline. Some parts of the city continued to be populated until recent times. The area around the valley was examined in the Palestine Exploration Foundation (PEF) survey (1866-1877) by Wilson, Conder and Kitchener. This area appears in the center of the section of the map of 1878 (below). As seen, the site is located on crossroads of ancient highways: an east going road (marked by a double dashed line) traverses the site on the way to Nazareth and beyond. Another road connects North via Acre, to South via Yokneam. These gave the site a strategic importance. "el Harithiyeh - A miserable hamlet of mud, on high ground, with an open plateau to the east and a spring below on the west ('Ain el Ghafr). The population in 1859 is stated by Consul Rogers at 120 souls, and the village at twelve feddans. This place has been supposed to be the ancient Harosheth of the Gentiles from the identity of name (Judges iv. 2). The position is not an impossible one. 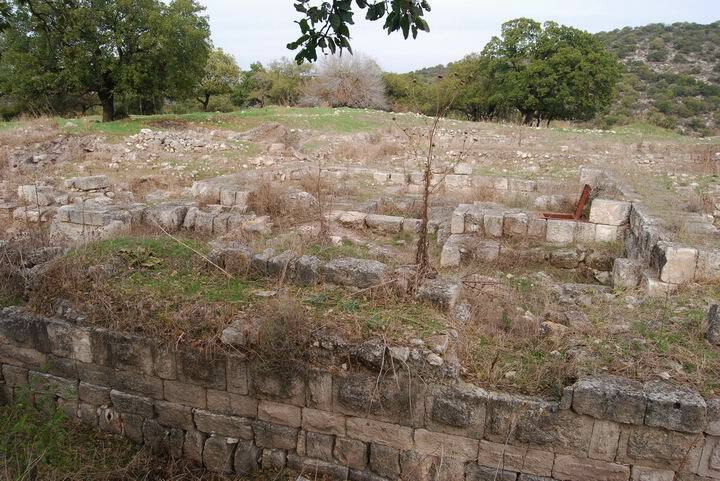 Guerin proposes this place as the site of Josephus's Besara (Life iv 24), which was twenty miles from Gaba. He places Gaba at Sheikh Abreik". "Kh. el 'Asafneh - Heaps of stones". During the World war I (1916-7) the Turks had an army base that dug into the hills of Harithiya, since they anticipated that the British will advance through the Kishon valley just below the site. Today Khirbet Harithiya is in ruins. It was excavated by Prof. Arthur Segal of the Haifa University. South-east to it is Kibbutz of Sha'ar Ha'amakim, established in 1935 by Zionist pioneers from Yugoslavia. A drone view from the east side of the site is seen below. The ruins of the site are scattered on the hill, with a small section excavated in the center. In the left background is Mt Carmel, with the Biblical mound of Tell Mea'mer in front its foothills. 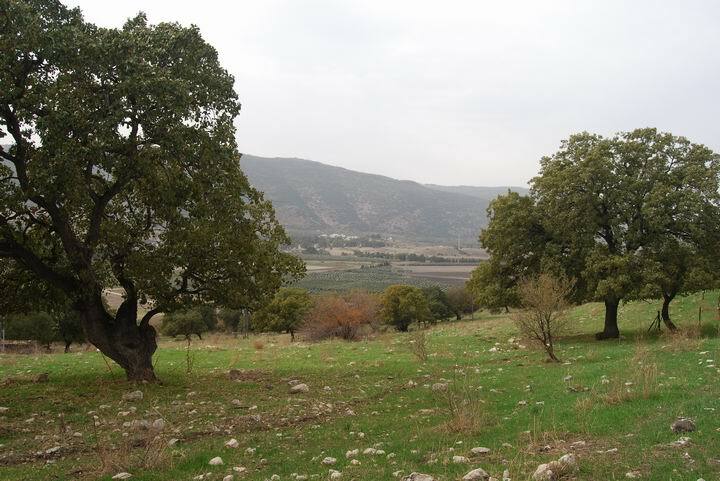 The photo below, towards the west, shows the area of Khirbet Harittiya, which is in ruins and buried under the hillside among the oak trees. In the far background is the northern slopes of Mount Carmel, and in the near background is Tell Meamar (el-Amar), which predated the site. A view towards the south shows the west side of Kibbutz Sha'ar Haamakim. Some parts of the ancient site are buried under the houses on that southern side. A wide panoramic picture of the area around the site is seen in the photo below. The next photos show the site from the south side. 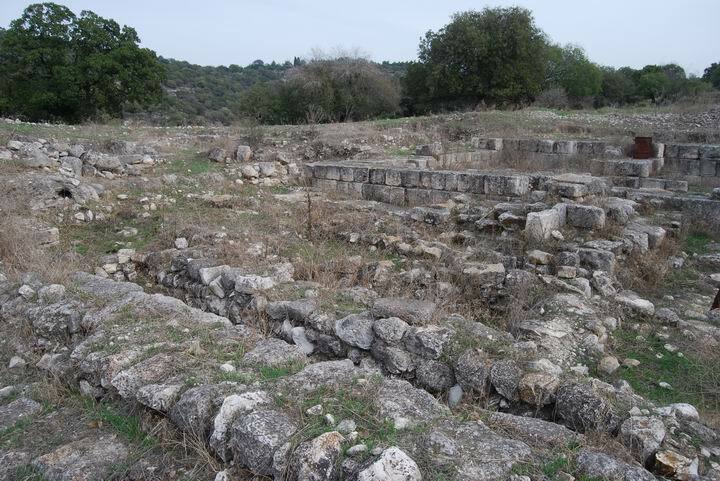 The excavation unearthed a Hellenistic structure on a hill on the north-west side of the Kibbutz. *** The information is preliminary - we will add more data on this excavation. Another view towards the north-east. A view from the west side towards the north-east. 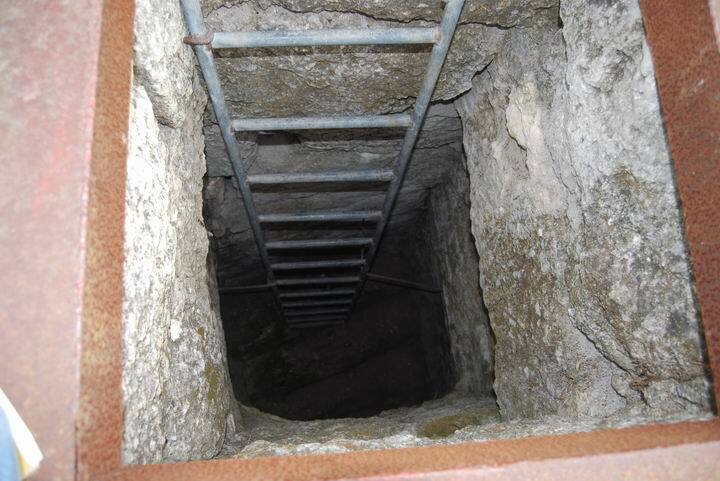 Stairs lead down to a pit located under the structure, under the rusting cover that is seen in the upper photo. A view towards the west. A second hole and ladder is located at this point. Another view towards the west. The south-west corner of the excavation, with a view of Mount Carmel in the background. In this text the Historian (ex-commander of the Galilean Jews against the Romans) describes the new city of Geva (Gaba) which is where King Herod (37BC-4BC) resettled his retired horsemen. When the Jewish revolt started in 67AD, the Jewish rebels attacked several cities, including Geva (Gaba) where a Roman unit was positioned (as per the next text). Now the people of Cesarea had slain the Jews that were among them on the very same day and hour [when the soldiers were slain], which one would think must have come to pass by the direction of Providence; insomuch that in one hour's time above twenty thousand Jews were killed, and all Cesarea was emptied of its Jewish inhabitants; for Florus caught such as ran away, and sent them in bonds to the galleys. Upon which stroke that the Jews received at Cesarea, the whole nation was greatly enraged; so they divided themselves into several parties, and laid waste the villages of the Syrians, and their neighboring cities, Philadelphia, and Sebonitis, and Gerasa, and Pella, and Scythopolis, and after them Gadara, and Hippos; and falling upon Gaulonitis, some cities they destroyed there, and some they set on fire, and then went to Kedasa, belonging to the Tyrians, and to Ptolemais, and to Gaba, and to Cesarea; nor was either Sebaste [Samaria] or Askelon able to oppose the violence with which they were attacked; and when they had burnt these to the ground; they entirely demolished Anthedon and Gaza; many also of the villages that were about every one of those cities were plundered, and an immense slaughter was made of the men who were caught in them. In this text the Commander talks about his acts during the preparations to the revolt (66-67AD). In this text he actually describes the range from Gibea (Geva) to Beit-Shearim (Besara) - 20 furlongs (4KM), which is the location of Kh. Harithiya. This is an important identification hint for the site which were used by the scholars. Arabic for "the ploughed land". Also called Geva-Parashim (Hebrew for "horsemen"), since Herod resetlled his retired horsemen in this city. Carta's Atlas of the 2nd Temple Period - M.Avi-Yonah [Carta Jerusalem 1966] - Shop for this must-have book. "Four Seasons of Excavations at the Hellenistic Site at Shaar HaAmakim", Qadmoniot 81-82 (1988), pp. 24-30. [Hebrew]. Prof Arthur Segal, Univ of Haifa - the excavator in Harithiya. Tell Kassis - located 5KM to the south. Identified as Biblical Khelkat. Beit Sharim - located 3-4KM to the south-east, and was a large ancient city, including a famous necropolis (with tombs buried inside caves).